Operation Iron Hammer was launched by Multi-National Division North (Task Force Iron) on November 5, 2007. Iron Hammer is a division-level offensive operation and a follow-on to Operations Lightning Hammer I and II. It is a sub-operation of the corps-level offensive, Operation Phantom Strike. The Iron Hammer offensive was led by Major General Mark Hertling, Commanding General, Multi-National Division—North (MND-N). The aim of Operation Iron Hammer was to pursue and dismantle al Qaeda and other insurgent groups, by targeting its cell networks, financiers, leadership structure, and transport structure. In addition to these security aims, Iron Hammer also sought to set the conditions for tribal reconciliation efforts, improved governance, and economic progress. As was the case in Operations Lightning Hammer I and II, intelligence-driven raids were the primary means for targeting the enemy during Operation Iron Hammer. 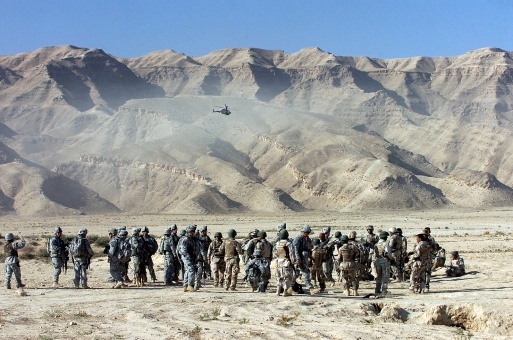 Planning for Operation Iron Hammer began in late June and early July 2007, months before Major General Hertling and the 1st Armored Division arrived in theater. It was planned in conjunction with the 25th Infantry Division, which at that time was responsible for MND-N and was involved in clearing Baqubah under Operation Arrowhead Ripper. The planners initially focused the operations on the area known as the Za’ab Triangle. The Za’ab triangle consists of the areas north of Baiji along the Tigris to Sharqat and east to Hawija, in Kirkuk province. In early July, planners believed that al Qaeda would regroup in the rural Za'ab triangle as they fled Baqubah and the northern belt. The Za'ab triangle was already an al Qaeda safe haven, because the Coalition and the Iraqi Security Forces had little presence in the region prior to September 2007. From August until November, planning adjustments were made in response to the enemy’s activity. Ultimately, Operation Iron Hammer expanded to include areas in four provinces of northern Iraq—Salah ad Din, Diyala, Ninewah, and Tamim. While initial plans called for only three Coalition Force brigades and two Iraqi Army divisions to participate, this changed as the area of operation expanded. Ultimately, Operation Iron Hammer involved all five of the MND-N brigade combat teams. In addition, all four of the Iraqi Army divisions stationed in the four provinces participated in the operation. By November 19, 2007, the two-week operation had ended. In all, 79 arms and ammunitions caches had been discovered. 29,000 liters of nitric acid, a chemical used to manufacture explosives, were discovered at a car-bomb factory. Additionally, Coalition and Iraqi soldiers discovered over 500 mortar and artillery rounds, nearly 500 rocket-propelled grenades (RPGs), 50 RPG launchers, more than 100 heavy and light machine guns, and hundreds of anti-tank and anti-personnel mines. The largest EFP cache ever found in Iraq was also discovered during Operation Iron Hammer near Khan Bani Sa’ad in Diyala province. The follow-on operation to Iron Hammer is Iron Reaper, which has continued the pursuit of al-Qaeda in specific areas of northern Iraq.